Andy Sandness wasn’t born looking like that. He’s lived with the consequences of a “wrong choice” for more than a decade. Agreeing to get Mayo Clinic’s first face transplant won’t undo his decision. But now he has a second chance for a normal life. Guys do stupid things. I should know, since I am one. Some of us, eventually, learn a little wisdom. Everett “Red” Knowles was 12 when he decided to hop a freight train on his way home. That was May 23, 1962. Red got up and walked away, holding on to his arm, still inside his shirt sleeve. Folks working in the area helped him get to a police ambulance, which carried him across the Charles River to a Boston, Massachusetts, emergency room. He and Dr. Ronald Malt, Massachusetts General Hospital’s 30-year-old chief surgical resident, achieved a measure of fame that year. Red’s arm was kept on ice until surgeons could start work reattaching it. Doctors had reattached blood vessels, nerves, muscles, bones, and other tissues, before: but never an entire limb. Dr. Malt’s team reconnected Red’s bone, muscles, skin, and blood vessels first. I’m not entirely sure why they waited until September to reattach the nerves. I gather that they figured letting the arm heal a bit before working on the wiring was a good idea. A few weeks later, Red was feeling severe pain in his right arm: which was good news, under the circumstances. A year or so later, Red was playing baseball again: as a lefty. As an adult, folks called Everett Knowles “Eddie.” For a while he made a living lifting sides of beef. He drove trucks, taxis, and school vans; did volunteer work; and died last year. Someone called him “a good friend and a pretty good mechanic.”2 I think that’s a good way to be remembered. I was 11 when I read about “Red” Knowles’ accident.1 That was a few years before Christiaan Barnard’s successful human-to-human heart transplant, so reattaching an arm was a very big deal. It still is, for that matter. What’s “extraordinary” has changed over the millennia. Quite a bit of that change happened since I was a child. I don’t think reattaching a 12-year-old’s arm was a bad decision. Maybe it’s an ‘extreme medical procedure,’ but the expected outcome was extreme, too: four working limbs, not three, for someone who could reasonably be expected to live for decades. I’ll be talking about a face transplant done at Mayo Clinic. The patient had lived about a decade without most of his face, thanks to an unsuccessful suicide attempt. The donor tried to kill himself, too: and succeeded. Suicide is a personal topic for me. My first suicidal impulse came in my teens, a woman who was very dear to me killed herself, and that’s another topic, for another post. We’ve been getting replacement parts for ourselves for a long time, like that artificial big toe. I’ll get back to that. Vishpala’s iron leg is the first one we know of. She was either a warrior or a horse. Folks writing the earliest Rigveda books apparently assumed their readers knew all about her. Where was I? Vishpala, Hattusa, replacement parts. Right. Herodotus wrote about Hegesistratus of Elis. Apparently he cut off part of his foot to escape Spartans. Hegesistratus , that is. Later, he “made himself a foot of wood.” (“The Histories,” 9.37, Herodotus) That was about two dozen centuries back now. The Capua Leg was buried with someone about 300 BC. It was destroyed during World War II, but there’s a replica in London’s Science Museum. The oldest prosthetic we’ve found so far is Tabaketenmut’s wooden toe. She was buried in the Theban necropolis in 800 BC, give or take a century or so. Testing with a replica showed that it would have let Tabaketenmut walk while wearing Egyptian sandals. Themistocles Gluck made the first endoprosthesis in 1890, using ivory to resurface someone’s wrist. The first metal hip replacement was done in 1940. Basic research leading to artificial heart pacemakers started in 1889. That’s when John Alexander MacWilliam noticed that “strong galvanic and faradic currents” could make a human heart beat: or stop it, and the human, permanently. More research was needed, obviously. Arne Larsson received the first (working) artificial pacemaker in 1958. Melanoma killed him a little over 43 years later. Heart-lung machines have a similar history; but they’re still too big to fit inside someone. We have a few artificial heart prototypes, though. Heart-lung machines and pacemakers weren’t invented until well after the Gospels were written, so our Lord didn’t mention them specifically. Simple? I think the answer is yes: and no. “For the past 10 years, 32-year-old Andy Sandness has been faced with the worst mistake he’s ever made. “He was 21, battling depression and so he decided to shoot himself in the face. He says he immediately regretted it. “A decade later, the eastern Wyoming man got a second chance at a new life. I should think he’d be “a little nervous.” Upwards of 20 face transplants have been done since the first one, in 2005,4 but it’s still a very new procedure. Face “replants” are a bit older. Sandeep Kaur was nine when her hair got caught in a thresher, tearing off her face. Her mother saw the accident and got her daughter to a hospital, carrying both pieces of the girl’s face in a plastic bag. That was in 1994. Abraham Thomas, a very skilled microsurgeon, reconnected the pieces. Sandeep recovered, with some scarring and muscle damage. As of 2004, she was learning to be a nurse. The first partial face transplant, in 2005, was successful, at least for a while. The donor, another woman who may or may not have committed suicide, was brain-dead when part of her face was removed. I hope so, at least. We have inconsistent accounts of Dinoire’s and the donor’s cause of unconsciousness and death. I suspect that’s because suicide is an uncomfortable topic. As I said before, I think it’s a bad idea. If nothing else, it seems to make messes worse. Anyway, Isabelle Dinoire’s 2005 surgery was successful, in the sense that drugs kept her body from rejecting the transplant. At least for a while. She apparently lost use of her lips during the winter of 2015-2016, and died the next April. That author’s concern for “the relationship between nationalism and medical advancement” is a can of worms I’ll leave for someone else. As Dr. Samir Mardini said, most of Andy’s upper and lower jaws were missing, along with his nose. There wasn’t much left to reconstruct. The good news was that surgeons could patch and stitch what was left of his lower face into a small mouth and single nostril. The not-so-good news was that he looked — odd. As the narrator said, “social interactions have been a challenge, and dating nearly impossible.” He spent a lot of time in Wyoming’s high country. Some, not many, men have chosen a life far from other folks. Most of us prefer living among other people. “In June, the Mayo Clinic performed its first face transplant. “The medical feat, which is still a relatively uncommon procedure, was punctuated by the heartbreaking stories of two young men under very similar circumstances — one ending with a damaged face, the other in a death. I haven’t read why Calen “Rudy” Ross decided to kill himself. He’s the other young man Lydia Ramsey mentioned. My hat’s off to his widow. She was 19, eight months pregnant, and handled the additional decision-making with what I think is admirable reason, foresight, and resolve. Her husband’s driver’s license had the ‘organ donor’ option checked. A few discussions later, she, LifeSource, and Mayo Clinic, were working to honor Rudy’s wish. “…Months earlier, both he [Sandness] and Lilly Ross had expressed interest in learning about each other. She particularly wanted him to know about her husband, an adventurous, spontaneous guy. “Last fall, she wrote to Sandness and the five others who received her husband’s organs. She described Ross, her high school sweetheart, as a ‘giving person’ who loved hunting, trapping and being with his dog, Grit. ‘I am filled with great joy knowing that he was able to give a little of himself to ensure a better quality of life for someone else,’ she wrote. I don’t think the organ and face donations make Rudy’s suicide “okay.” I do think Lilly made a good decision, under extremely difficult circumstances. I can’t reasonably say that suicide or any other bad idea is okay. Happily, my connection with Rudy, Lilly, Leonard, Andy, and all, is quite remote. At the moment, my concern is mostly making sense in this post. “…The moment Sandness realized his face finally looked normal came three months after the procedure. He was in an elevator, and a little boy glanced up at him without being startled, something that had never happened before the surgery. “…Sandness had to undergo a rigorous psychiatric and social work evaluation to address, among other things, a key question: Should this surgery be performed on someone who’d attempted suicide? “Several factors were in his favor: His resilience and motivation, a strong support network of family and friends, a long-standing rapport with Mardini and a gap of several years since the shooting. Doctors also noted others with self-inflicted injuries, such as excessive drinkers, have received liver transplants. Transplants from one person to another trigger an immune response, unless the donor and recipient are twins. Our immune system is pretty good at attacking critters in our body that don’t have our genes. That’s a good thing; when bacteria, viruses, or parasites get past our skin. When the non-identical code is in a transplanted organ, it’s not so good. That’s why folks with transplanted parts take immunosuppressive drugs for the rest of their lives. The drugs have various unpleasant side effects, but not taking them means the new kidney, heart, or whatever, stops working. Having an offline immune system isn’t good, either, which is why balancing benefits and risks is so important. “He’d been waiting for this day, and when his doctor handed him the mirror, Andy Sandness stared at his image and absorbed the enormity of the moment: He had a new face, one that had belonged to another man. “His father and his brother, joined by several doctors and nurses at Mayo Clinic, watched as he studied his swollen features. 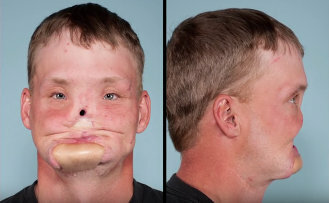 He was just starting to heal from one of the rarest surgeries in the world — a face transplant, the first at the medical center. He had the nose, cheeks, mouth, lips, jaw, chin, even the teeth of his donor. Resting in his hospital bed, he still couldn’t speak clearly, but he had something to say. “‘Far exceeded my expectations,’ he wrote, handing it to Dr. Samir Mardini, who read the message to the group. The transplant operation kept two operating rooms, about 60 surgeons, nurses, anesthesiologists, and other folks busy for 56 hours. They didn’t stay awake through the whole thing. STAT News says that individuals would take four-hour breaks along the way. One of the really tricky, or maybe tedious, parts of the process was testing the nerve branches to see which should be connected. We’ve come a long way since Luigi Galvani learned how to make a dead frog’s legs jerk, and that’s still another topic. “…He’s thrilled to smell again, breathe normally, and be eating foods that were off-limits for a decade: apples, steak, and pizza that he shared with his doctors. “His transformation isn’t just visible. After the shooting, he says, when he dreamed, he still had his old face. Now, his new face appears in his dreams. “Sandness, now 31, plans to return to Wyoming, work as an electrician and, he hopes, marry and have a family someday. “For now, he savors his anonymity. Recently, he attended a Minnesota Wild game. He bought some popcorn. He watched some hockey. He didn’t see any stares or hear any whispers. Being able to eat an apple and not scare children is nice. So, I think, is raising a family. I’m glad that Sandness has a second chance. This entry was posted in science news and tagged health, medicine, science, suicide, technology. Bookmark the permalink. I think I was confused by the “Four later” part.